James: Maybe you can’t change people’s minds by slamming doors in their faces. After the Russian-speaking Supergirl clone in the tag of the last episode, I expected Russian stuff. We didn’t get it, but I didn’t miss it. Instead we had press-related themes, which I found interesting. How do you win hearts and minds? Not by punching people, but by reaching out to them. But let’s discuss the action thread first. Agent Jensen has the parasite thingy from the DEO. This allows him to acquire the powers of any other alien that he touches – usually killing the alien in the result. This allows the writers to sideline Supergirl – after all, there’s not much plot when she can use all her powers – and if Jensen touches Supergirl he acquires her powers and she dies. Even Supergirl agreed that this scenario was lose-lose, so this time she stayed more in the background (although I liked how she was getting people out of the dome at the end – of course, stopping to ask people if moving them was OK would not work given the little time available; sometimes politeness has to be ignored). We also met Amadei, an alien whose super power is to heal others – as long as those others are also aliens. So, he’s resented by a bloc of humans, because he can’t heal them. Amadei used to give lots of interviews, but he’s been quiet for 20 years, but now he decides to speak up. Kara thinks it’s a good idea to interview the alien, but she’s rather rosy in her portrayal, and doesn’t do enough research. Of course there are unintended consequences. Amadei’s two decades of silence is apparently due to a daughter he had with someone else who is now really mad at him. The daughter’s mother turns her personal resentment into a reason to hate all aliens – how often the personal is generalized; I suppose if you turn a grievance into a cause, it seems less petty – and this woman is responsible for the theft of Amadei’s amulet. Anyway, Amadei’s amulet is stolen and given to the group that is targeting aliens, which gives parasite guy even more power. James is frustrated by the fact that he, in his role as Guardian, is being hailed as a hero by what he considers hate groups. But Lena Luthor (who so often has really interesting viewpoints) thinks that their approval of him is what will allow him to speak to them and bring some unity. James doesn’t agree with her at first, but later he decides to consider her approach, even calling Ben Lockwood to talk. We see this several times in the episode, that characters seem adamant in their positions, but later yield a little. Kara is tired of being disappointed by always hoping for the best in people – she says it doesn’t work – while Alex says she has always expected the worst, and that approach isn’t successful either. But to contain Agent Jensen, Alex uses persuasion, appealing to Jensen's better side - instead of shooting him with her special weapon (which would have also killed a lot of people). Colonel Haley was very supportive of Director Danvers for most of the episode. Part of this was due to outcome-based morality, where the end justifies the means, and some of Danvers’s decisions will probably save a lot of people. We – Alex, the audience, and dear Brainy – are surprised by the relative lack of tension. 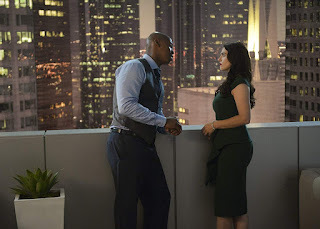 But then Haley says she’s glad to have a human as the director now – that she never felt comfortable with J’onzz as head of the DEO. As Alex considered J’onzz family, this is unpleasant for her. I can understand both points of view - always good when an episode does this. Anyway, at which point Colonel Haley reminds Director Danvers that she needs to salute before departing. As that’s protocol, Alex makes the salute. I wonder if we’ll see some persuasion on the part of Alex with respect to Colonel Haley or not. Title musings: The title of the episode is “Parasite Lost,” and the most straightforward interpretation is the fact that a thingy created by the DEO with the code name parasite was actually lost. And, in the end, the guy with the parasite in his ear loses too, so that works as well. The title is also reminder of “Paradise Lost,” a famous epic poem by John Milton, telling about how Adam and Eve fall from God’s grace and get kicked out of the Garden of Eden. I think they could have done a lot more with this. You can contort other parts of the episode into the Paradise Lost meaning if you try – so much of everything is about going from ignorance to less ignorance, and discovering that your idyll has got some flaws, but you can’t go back to it. However, I think the themes could have been much clearer. The recap shows the parasite being put into the ear of Agent Jensen, which will remind most people of The Wrath of Khan. But I watched this show on a day when I received an injection into my ear, so that’s what I was thinking about. The open shows our heroes having a brunch on a really pretty rooftop set. I hope we see it again. 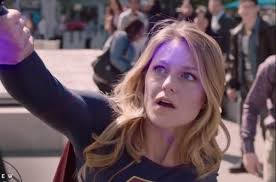 When Agent Jensen attacks Supergirl, the show did a great job of making the very pretty Melissa Benoist look terrible, so I’ve included a photo. Strange that Amadei can breed with a human but can’t heal them. But I suppose that we're not supposed to examine such details. J’onn J’onzz is seen with his alien support group, where they share experiences. As aliens are having trouble getting the police to help them, they’re now turning to him when they have problems. Some plot potential there! There was a cute exchange between Brainy and Nia, who met a couple of episodes back in a pizza place. Nia had told Brainy to find her, which meant for him to call her. But he took it literally, and knew her address and all her habits. Kara is planning a series of interviews with other aliens, famous and ordinary, to work on the hearts and minds bit. Seems the way to go. Wonder if we’ll get back to this in a future episode. Supergirl: He can kill me and get supercharged at the same time. Kara: I always try to believe in the best in people and so much of the time that makes things worse. Alex: But don’t let that fear define who you are. Colonel Haley: You did good work today. But the next time I give you orders I expect for you to follow them. Barman: You’re the guy to go to when the aliens can’t go to the police. I thought this episode an improvement over last week’s offering, but I think they can do a lot better. The dialogue could have been stronger. Two and a half out of four ear parasites. I agree we need more Supergirl! Although this week's episode was sure an improvement over last week's.